This page describes how to configure a Bamboo task to parse MSTest results. 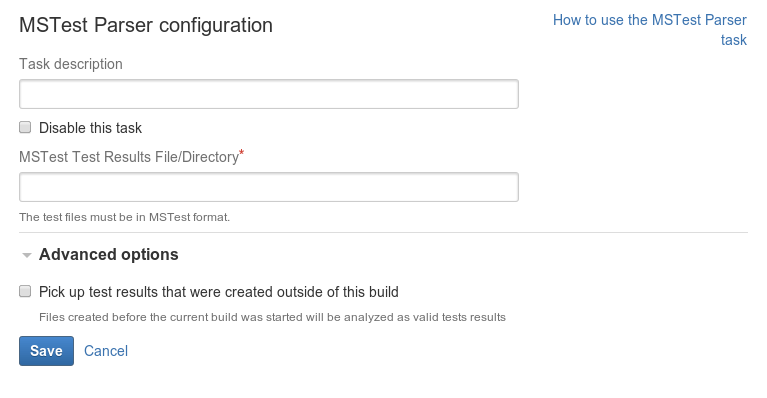 .NET builder tasks in Bamboo (for example NAnt) do not parse test information as part of the task. To have the test results parsed, you need to configure a test task such as MSTest Parser. Click the name of an existing MSTest Parser task, or click Add Task and then MSTest Parser to create a new task. Enter a description of the task, for display in Bamboo. Enter the name of the test results file. The test file must be in MSTest format. For more information on MSTest, see this MSDN page.